The Word’s how it all began. The Word will come, for the Word is what he is. He was God & with God before it began. All of it was made through him. Nothing, seen or unseen, came about without him, for in the Word was life. Deep within him life sourced forth to radiate into the world as glorious light. And Darkness cannot stand, nor sway, nor conquer it. But God sends His conquerors. Nothing but the light, so through illumination the nations might overcome. John’s not light, he’s a witness on the stand, a pawn in our King’s hand. Thick, true light would soon burst into earth. They opened arms, opened hearts, & welcomed their Word, praying to him. To Receivers He gave a birthright, an identity, that none could take away. They’re not Children of men. They are born of God himself. Despite our minuscule, minor shelters. For all orbited his tent. 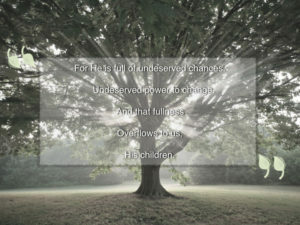 For He is full of undeserved chances.